Hello, my loves! Today, I am very excited to be bringing you a brand new review of the Dior Lacquer Stick in the shade Lazy (£26.50, Boots). 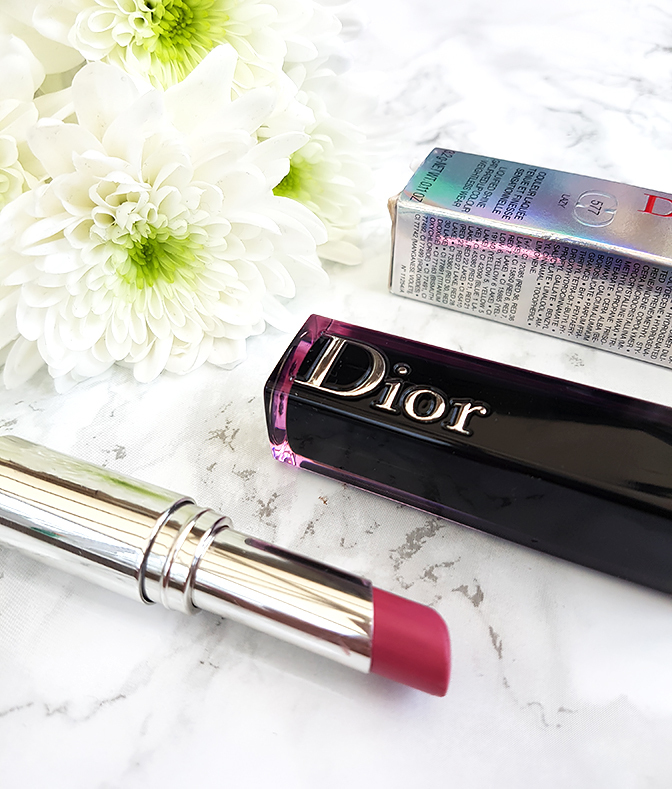 I have always been a huge fan of Dior lipstick formulas, and when I saw that they introduced a new range, I simply couldn't resist! I mentioned this one in my spring makeup favourites, and today, we're going to talk about it in a little more detail. There is also a little giveaway for you at the end of this post, where you can enter to win a Dior lipstick of your choice! The Lacquer Stick is a brand new lipstick by Dior, promising 'a lip fondant effect that liberates all the colour and shine of a lacquer, plus the comfort of a balm, with six hours of wear and unrivaled texture' (Dior website). 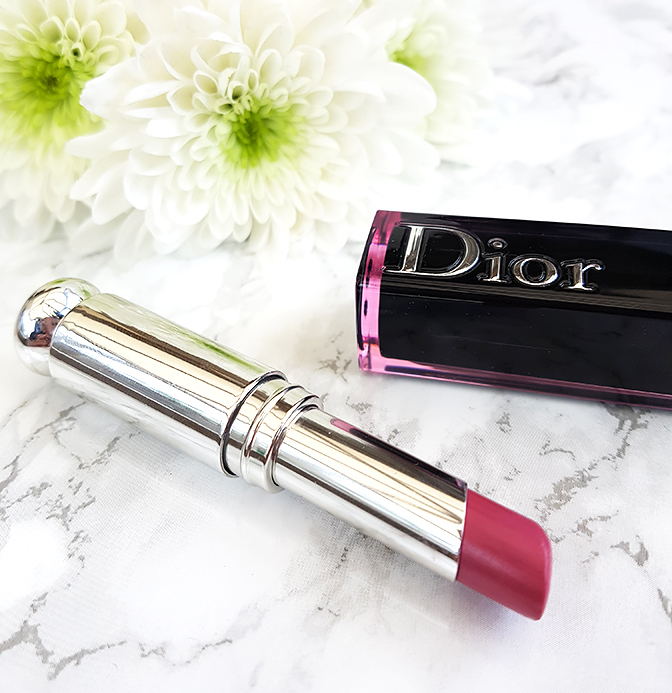 I have always enjoyed Dior's formulas and how comfortable they feel (my lips get really dry and sensitive so a lot of lipsticks, especially matte ones are a no-go! ), so I was pretty excited to try this one. It definitely appears to be more of lip balm rather than a classic lipstick, but with a better colour payoff. The Lacquer Stick comes in twenty different shades, ranging from subtle nudes to vibrant reds, and pinks. I picked up the shade 577 Lazy, which comes in a gorgeous, elegant Dior packaging. 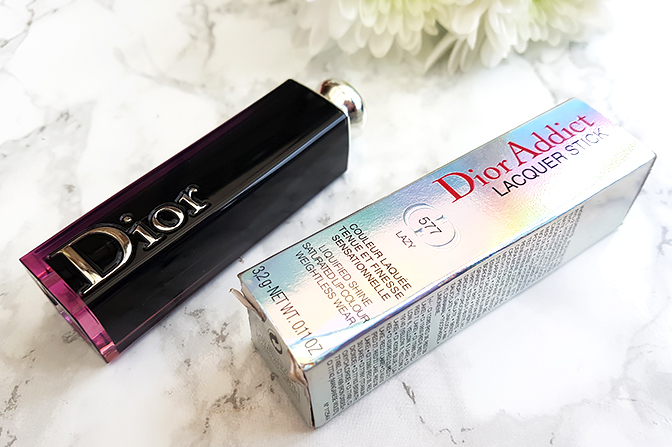 The plastic tube is much darker and it looks a little more edgy than the regular Dior Addict lipstick range, which I think is a great spin on their classic packaging! The formula is easily my favourite thing about this lipstick! The texture feels incredibly lightweight, hydrating and non-sticky. It's honestly more like a luxurious lip balm rather than a creamy lipstick, which is exactly what Dior promises with the Lacquer Stick. The pigmentation is also impressive, especially for a formula that's this lightweight - the colour looks gorgeous, vibrant and ultra-glossy when applied, and very true to how it appears in the packaging. This lipstick just 'melts' onto your lips you apply it, making them look fuller and plumper; and it also does a good job at concealing any imperfections (which is a huge plus if, like myself, you suffer from dry, cracked lips all year round!). The shade I picked up, 577 Lazy, is a light, slightly raspberry-toned pink, which I think is incredibly versatile and perfect for casual spring makeup looks. The only downside is the lasting power, which doesn't seem to be anywhere near as good as advertised (about three hours as opposed to six). The lightweight formula doesn't last through eating or drinking, but it's really easy to top up whenever you need it. Other than that, I absolutely love this lipstick and I think that it's a significant step-up from the regular Dior Addict lip range, especially in terms of pigmentation and comfort. An honest 9/10 from me! As a little thank you for all the love and support on my blog, I am giving away one Dior Lacquer Stick lipstick in a shade of your choice! You will be able to pick one of the twenty shades available on the Dior website. ♥ The giveaway will run from 10th May 2017 to 15th June 2017. The winner will be announced the following day in this post, as well as on my Twitter page. ♥ You must be at least eighteen years old, or have your parents' permission to enter. ♥ I will be contacting the winner directly after announcing the results (via email and Twitter, if available). The winner must respond within 48 hours, or they will lose the prize, and a new winner will be selected. ♥ Any 'follow to unfollow' entries will be automatically disqualified. ♥ This giveaway is open worldwide. However, please note that depending on your country, you may incur customs charges. That payment would be at your discretion, and failure to do so could result in you losing the prize. You can enter the giveaway using the Rafflecopter widget below. All you need to do is follow me on bloglovin', and leave a comment in this post letting me know what is your one favourite spring makeup item! For additional chances to win, you can also follow me on Twitter, Instagram, and subscribe to my YouTube channel. This is completely optional, but it will give you additional entries and more chances to win! "Life" after Kinga - the Early Days. 100 Beauty Blog Post Ideas! Kinga Głowacka - Extended Thoughts.